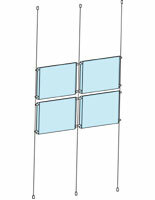 Ceiling-to-floor cable system included for each column of frames, ideal for window advertising. 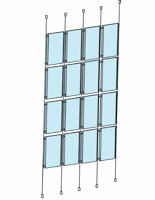 Metal cable system components have a satin silver finish to enhance the contemporary design of the matrix. 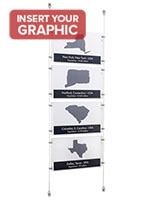 17"w x 11"h Signs top-load into acrylic frame for easy and quick switching of graphics. These ceiling hung sign systems, also known as a window hanging systems, hold large graphics to grab the attention of customers. 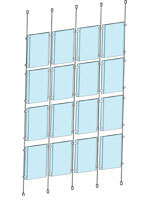 This system includes the acrylic panel and all hardware to easily mount the display virtually anywhere. These cable display systems, ceiling hung sign systems have all of the necessary hardware for fixed mounting from floor to ceiling. The 1/8" thick acrylic panel is included with this system and it holds 17"w x 11"h panels for attention grabbing signage. These ceiling hung sign systems can be used for a double sided display which makes them ideal for window displays. 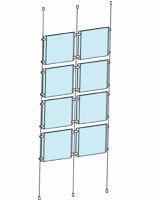 This set includes the top-loading panel for easy switching of marketing materials. These ceiling hung sign systems form a contemporary-looking signage matrix for businesses trying to portray a modern and innovative image. 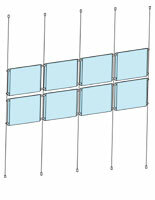 This system comes with the acrylic panel and the hanging hardware. These ceiling hung sign systems come with durable components that require virtually no maintenance or rehanging once mounted. This signage can be displayed in a wide variety of environments including restaurants, retailers, hotels, real estate agencies, office buildings, and many more! Users can maximize use by placing graphics back to back for a double-sided display. 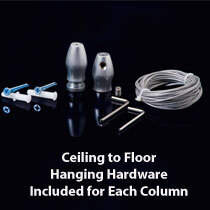 These ceiling hung sign systems are designed for businesses to advertise. 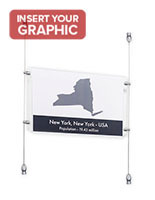 The included acrylic panels have a top-insert design for easy switching of graphics when needed! Please Note: Dimensions listed are per frame. 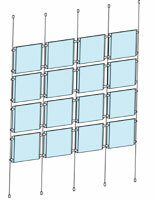 Display height will depend on number of sign holders linked together.